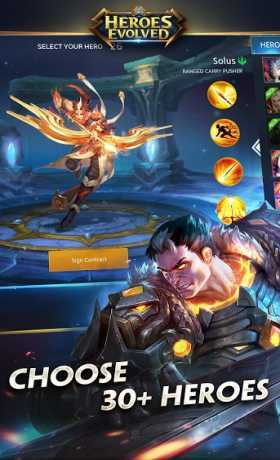 Welcome to Heroes Evolved, a carefully balanced competitive mobile game of action and strategy for true gamers. Select from a pool of 30+ unique heroes and jump into teams – Eternals vs. Ancients – to battle against real rivals on gorgeous fantasy maps. This game will take all your skill, teamwork, cunning, and strategy to survive and succeed! Grab your device and dive straight into combat with stunning graphics and seamless animation. Heroes Evolved is a unique game of depth and complexity, allowing you to piece together your own strategic and unpredictable advantage using fog of war, terrain, unique hero attributes, and custom gear builds. Be a stalwart tank character with healing abilities. Become a devastating rogue attacking from the shadows. Bombard enemies from afar with powerful abilities, or shred your opposition to bits in ruthless melee combat – the choice is yours! No two games are ever the same! 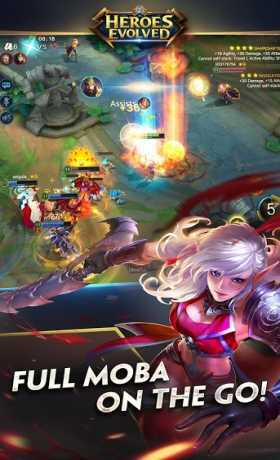 ● As deep as the PC version – Get your full MOBA experience on the move! ● Revolutionary controls – Unleash your skills & abilities with deadly precision. ● Custom gear builds – Pick your favorite items & create unique hero loadouts. 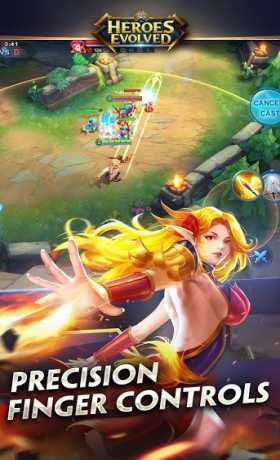 ● Quick matchmaking – Battles designed for short burst game-play sessions. ● No Pay 2 Win! – Carefully balanced mechanics to guarantee you a fair game.